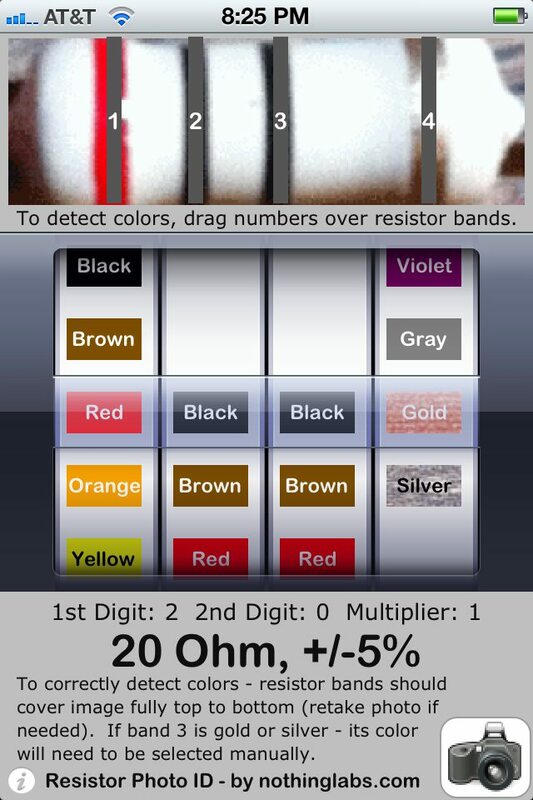 It uses your iPhone’s camera to help identify resistor values. I specifically developed it with color blind people (like myself) in mind – who can’t successfully ID resistors even if they take the time to learn the color codes. Click here to get it from the Apple App Store (currently free!). 3. Resistor Photo ID provides you with the resistance and tolerance of the resistor! 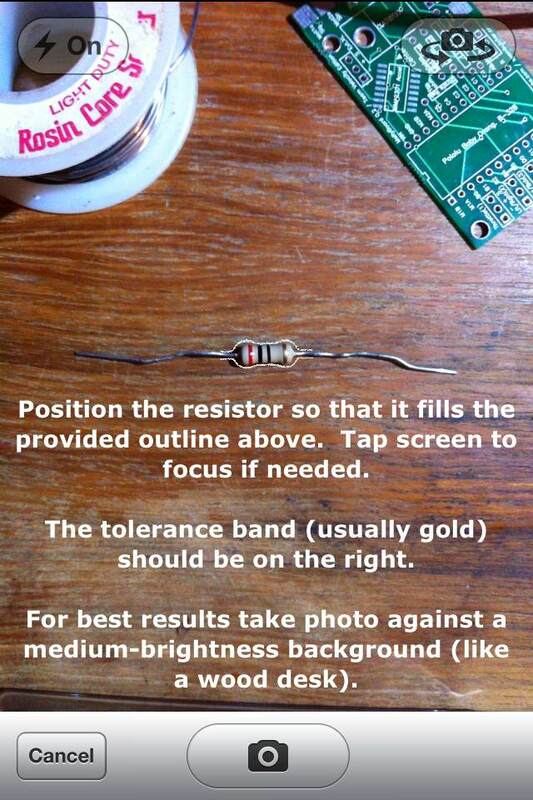 If for any reason Resistor Photo ID doesn’t detect the correct color for a band – you can easily override it. 1. Seems like adding support for 5-stripe resistors wouldn't be too difficult. I've not come across one in real life, so it doesn't affect me personally. Just a thought. 2. You could add a little "AI" or sanity checking on values. For instance, the app read the first stripe as Black in one case. I don't think that's possible. Probably if it looks black in that case, it's brown. There were a couple of black/brown misses, but some of that may be due to the fact that I was taking pictures of an image of a pretend resistor on a computer screen. 4. A couple of times when going to take a photo, the shutter leaves didn't open. Not sure what was going on there. 5. Most of all, *thank you* for a great idea brought to fruition! Kudos! thanks for the feedback! these are all good ideas – and will consider them if I find time to rev. the app. This is a great app and it seems like it will be very helpful for people learning about resistors. I have wanted something like this for a long time. Any chance you would make it for an android? I would be willing to pay a reasonable price for the Android app. haven't dipped my toes into doing android stuff yet – so I'm not planning on doing a version any time soon. but – I'm certainly not claiming any "rights" to the idea – so if any android devs want to make a clone – go for it! I'll second that request, would definitely be willing to pay for this on Android! Seconded as well, as I have a 'Droid here. On the flip side, can someone do one of these for those nasty little SMD resistors? A lot of folks spot recycle these from dead boards and the 0603 are not human readable. Capacitors are sometimes UV marked with little dots so aren't easily ID'd. Why is this app not available in the Canadian store. I do a great deal of custom electronic amplifier builds. Being color blind I am forced to check every resistor with a meter. This app would be a great help by saving me a lot of time. Unfortunately due to some changes in iOS – this app is no longer available (in all App Stores for all countries).